Ours is a simple game of luck. Place a bet on a 4-digit number and see if your number comes up in any of the 23 winning numbers. Collect your winnings of up to RM3,500 per RM1 of bet. That’s it! Click on the following items for further information. This consists of 1st Prize, 2nd Prize and 3rd Prize. This consists of 10 Special Prizes. This consists of 10 Consolation Prizes. You may invest as minimum as RM1.00 for a particular 4 digits number at a single draw. Every RM1.00 you invest can win up to RM3500.00. Prizes are awarded according to the amount you invest in a number and the matched 4-digits number in each draw. 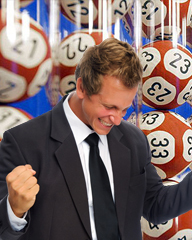 You can bet on any 4-digits number from 0000 to 9999 (both inclusive) that are open for sale on every draws. When the 4 digits number purchased match any of the 23, 4-digits number drawn, each exact match will win a cash prize. A RM1.00 bet on the big forecast gives you the chance to win up to 23 cash prizes as shown below. A chance to win higher cash prizes. When the 4 digits number purchased match with the first prize, and/or second prize and/or third prize,with the 4-digits numbers drawn for the selected draw will win a cash prize as below. A RM1.00 bet on the small forecast gives you the chance to win up to 3 Top Prizes, namely 1st prize , 2 nd prize and 3 rd Prize, as shown below. 1. Roll front" or "Roll back"
Rolling the front or back digit of your 4 digits number will generate 10 numbers with the front or back digits of each of the numbers running from 0 to 9 respectively. The choice is yours: to roll the front or back digit of your 4 digits number. Generate permutations of your favourite 4 digits number! Frequency of permutation is based on the particular number and occurrence of digits in it. Make a request for a lucky number that's randomly generated by the main Gaming Computer System. Where can I find results of the current draw? 4 digits bets can be placed at any of our 40 strong Sandakan Turf Club agencies located throughout East Malaysia (Sabah) during normal business hours. Special "marksense" forms are available at these outlets to make it so easy for you to place your bets. Prizes will be awarded only upon the presentation of valid winning tickets. • It must have been issued by Sandakan Turf Club agent through its authorised gaming terminal. • It must be intact; particulars on ticket must be clear and legible. • It must be recorded in the company's computer records prior to the draw and its particulars must be identical in all aspects with the records of the company's computer records. • It must satisfy all the company's security checks. • It must comply with and satisfy the requirements for a valid winning ticket as described under the company's rules and regulations. • Ticket must not have been altered, defaced, mutilated, torn or tampered with in any manner whatsoever. • It must not be recorded in the company's computer records as cancelled. • It must not be a ticket for which the company or its agents have already made a payout (i.e. awarded a prize). Special Draws: Subject to the approval of Ministry of Finance (MOF). No. 12, Jalan Tugu, Kampung Air, 88000 Kota Kinabalu, Sabah. 4D draws are conducted on the day of the draw, at 7.00pm sharp. All draws are open to the general public. Results are immediately available after each draw through the following channels: Results Board displayed at the relevant draw premise. The STC websites: www.stc4d.com Major leading newspaper in Sabah. *Results are also published in local leading newspapers and displayed at all Sandakan Turf Club (STC) agencies on the day after the Draw. Keningau Lot 48, Yee Seng Commercial Complex, Jalan Pasar, 89000 Keningau, Sabah. Sandakan Lot 5, Bandar Pasaraya Commercial Complex, Mile 4, Jalan Utara, 90000 Sandakan, Sabah. Lot 11, TB: 317, Fajar Complex, 91000 Tawau, Sabah. Unclaimed prizes of more than 6 months from the Draw date will be submitted to the Ministry of Finance, Malaysia.